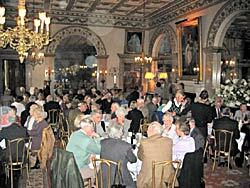 Members of the Thoroton Society lunching in the State Dining Room at Belvoir Castle on 6 November 2004. Tree planting at Flintham Hall. 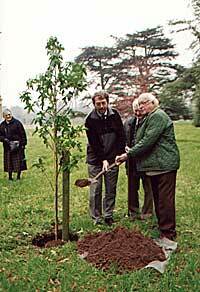 Chairman of the Society, Professor John Beckett (with spade), President, Neville Hoskins, and past-president Miles Thoroton Hildyard, planting a tree at Flintham on 17 November 2001. The tree, a Liquidamba styraciflua (sweet gum), was a gift from the Society to Mr Hildyard as a commemoration of his forty years as president, a position from which he stepped down at the Annual General Meeting in 2001. The Society is named after Mr Hildyard's distant ancestor, Rev Robert Thoroton, whose Antiquities of Nottinghamshire was first published in 1677. 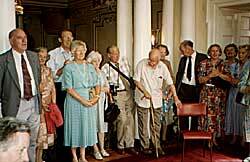 Society members at Doncaster Town Hall, 1992. Thoroton members enjoy excursions to places of interest throughout Nottinghamshire and further afield, often to venues which are not normally open to the general public.